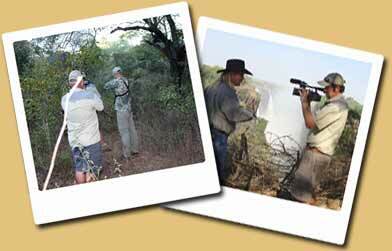 Having a safari professionally filmed is an extremely worthwhile supplement to the actual hunt. Considering the price of a safari, it’s an affordable service and well worth the price. So, when planning your next African adventure, consider this worthwhile service and ensure that your experiences can be passed down to future generations. The arrival of you and your hunting party or only you at the airport or safari area. The road trip to the hunting destination if filmed from the airport. All the professional hunters, guides and trackers who were a with you and a part of your adventure. Day of departure with you leaving camp or the airport followed by credits of everyone involved in the safari and filming and editing process. The Guarantee you get from us is that client satisfaction is the reason why we have a lot of return clients that act as living references. There is no better way to remember your hunting adventure than recording it to a DVD. Photographs and video give you the ability to relive the experience for many years to come. African Outdoor Visions is committed to producing broadcast quality personalized videos for clients from around the globe. Copyright © 2010 - African Outdoor Visions. All rights reserved.